THE SHOCKING INSIDE STORY OF THE GIG ECONOMY, AS ENDORSED BY BERNIE SANDERS A powerful and revelatory piece of journalism that exposes the exploitation at the heart of the low-wage economy. We all define ourselves by our profession. But what if our job was demeaning, poorly paid, and tedious? 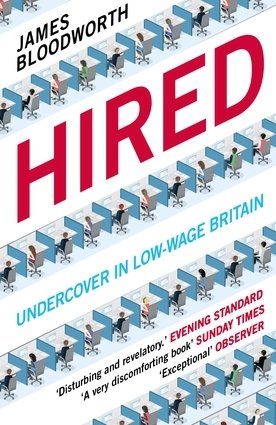 Cracking open the gig economy, journalist James Bloodworth spends six months undercover working the most grueling low-wage jobs. He lives on the meagre proceeds and discovers the anxieties and hopes of those he encounters, including working-class men and women, young students striving to make ends meet, and Eastern European immigrants. From a harrowing Amazon warehouse to Uber taxi-cabs, Bloodworth uncovers horrifying employment practices and shows how traditional working-class communities have been decimated by the move to soulless service jobs with no security, advancement or satisfaction. But this is more than an exposé of unscrupulous employers; this is a gripping examination of a divided society which needs to understand the true reality of how other people live and work, before it can heal.